Is cheaper gas here to stay? And if so, is that a problem for electric car maker Tesla? That's what investors appear to be suggesting. Shares of Tesla (TSLA) have plummeted more than 25% from the all-time high they hit in early September. During the same time frame, the price of crude oil has plunged more than 30%. 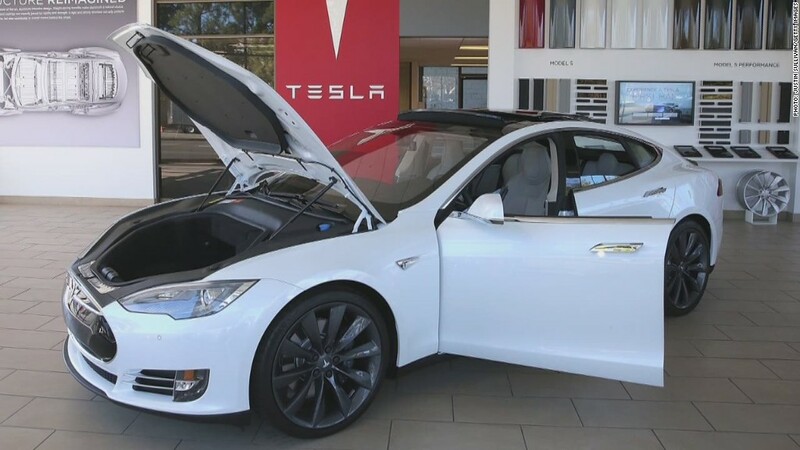 Is the huge drop in Tesla's stock an overreaction? On the one hand, you could argue that lower gas prices for the long haul may convince some consumers to stick with trucks and SUVs from the likes of Ford (F), GM (GM) and Toyota (TM). That could be bad news for Tesla ... and other alternative energy stocks. In fact, shares of SolarCity (SCTY) -- the solar panel company that Tesla CEO Elon Musk is chairman of -- have fallen more than 30% since early September as well. But it may also be coincidence that Tesla's stock is tumbling at the same time as energy prices. This could be a case of correlation not implying causation. It's true that lower gas prices could eventually be a more pressing issue for Tesla. But that won't really be the case until the company has launched the cheaper Model III vehicle that Musk is banking on to make Tesla a mass market company. And that is several years away. 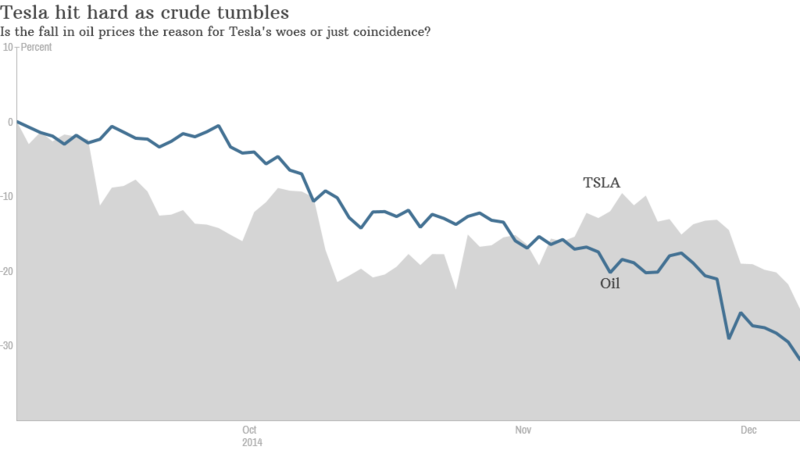 So falling oil prices probably aren't helping Tesla, but they are unlikely to be the only reason the stock is down. Morgan Stanley analyst Adam Jonas, arguably the most influential Wall Street analyst following Tesla, recently cut his earnings forecasts for 2015 due to doubts that Tesla will be able to produce as many new Model X crossovers next year as it originally hoped. And Jonas isn't the only one growing a bit more skeptical. Before Tesla reported its latest quarterly results last month, analysts were predicting that Tesla would earn $3.29 a share in 2015. The consensus forecast is now $2.88 a share. There are also lingering concerns about how easy it will be for Tesla to sell cars directly to consumers across the country. The company has been fighting a legal battle against dealers in several states, such as Georgia, Michigan, Texas and Massachusetts. Dealers don't like Tesla's business model of selling cars directly from company-owned showrooms, which are often in glitzy shopping malls. Tesla's biggest problem though is probably investors' lofty expectations. Musk may be guilty of fanning those flames a bit too. Remember when he tweeted about the upcoming launch of "the D?" He promised that it would be big news but investors were disappointed when it turned out "the D" was a dual motor model and not a new, completely driverless car. But even after you factor in the recent pullback, Tesla shares are up more than 40% this year. And that's on top of a 335% gain in 2013. As a result, Tesla's stock still trades at the ridiculously high price of nearly 75 times 2015 earnings estimates.